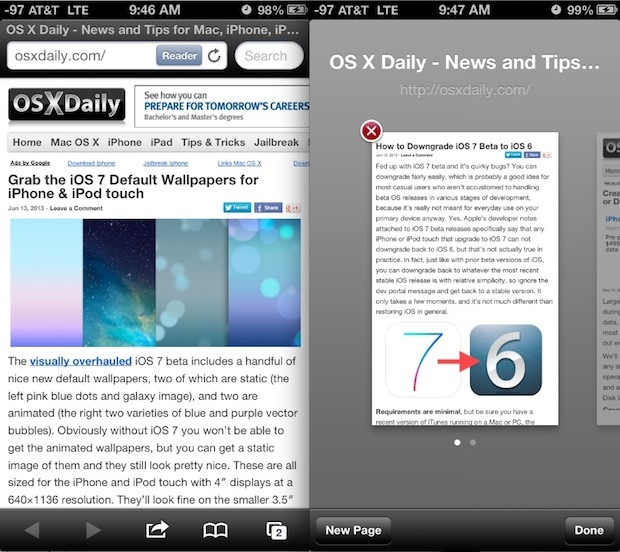 iOS allows you to enable private browsing in Safari for the iPhone, iPad, and iPod touch. This feature is sometimes called “Incognito Mode” with other browsers, and essentially this lets you browse the web and visit web sites without saving a record of any browser history, cache, logins, or searches, and it prevents cookies from being stored on the device. Private Browsing is an excellent way to maintain some secrecy for web activity in iOS, because whatever would normally be visible by whoever comes across the iOS device is no longer stored in any way on the device, and that will stay in effect for all sites as long as Private Browsing is left on. If you have currently active Safari browser windows open, it will ask if you want to keep or discard the existing web sites. We generally recommend choosing “Keep All” so you don’t accidentally close a browser window you wanted to keep open, but because it converts existing browser windows to Private Browsing versions, any saved data or cookies that have existed for that site will be missing after the refresh. At any point you can disable private browsing and go back to the normal browsing method, simply by revisiting Safari Settings to the same menu and sliding ‘ON’ to “OFF” again. You can further tweak the Safari privacy by adjusting cookie behavior in the same menu, though if you want to delete specific site cookies you need to do that through the “Advanced” options in Safari. If you do any online gift shopping, check a unique email account that is otherwise hidden, or a variety of other things on the web that you want kept private and don’t want others to discover, this is a great feature to get used to enabling. Other than losing the convenience of saved logins, some minor site customizations, and cookies, there is no harm with leaving private mode enabled all the time, and some users prefer to do this because of the privacy benefits, or even just because they prefer the darkened appearance of browsing in Private mode. They should have this for the Mac version as well. They do. They always did. Just look under the “Safari” menu. You can also browse privately in Firefox — under the Tools Menu. I am trying to turn off private browsing in iOS 7 on my iPad, but there is no “PRIVATE” showing in the lower left-hand corner and THERE IS NO “PRIVATE BROWSING” SELECTOR IN SAFARI SETTINGS! What is going on? They update the OS, but not the instructions! Can you tell I’m a little frustrated? So there is no possible way while in private mode for anyone to view the websites I have visited in the past? Unless it is p*rn in which case it saves everything and zips it up and sends it to your Mum. Makes looking at pr0 a whole lot easier! If ur on the same iCloud as someone in ur family will they be able to look at ur stuff with there devises with the private browsing? Can people still see what you are looking at? If you’re connected to a wireless router, will the router still pick up te websites you’ve viewed? And thereby potentially still allowing someone to check your iPhone history? Somehow private browsing was enabled on my iPad, but when I go to settings/safari, there isn’t anywhere to turn off private browsing. What do I do? I dnt have this option on my ipad mini. Why Dont I have it and how can i get the option to turn private browsing on? In iOS 8.2 you just have to tap on the Tabs button, then tap on PRIVATE to either enter into the private browsing mode, or exit out of private browsing mode. The tabs button looks like a square, iOS used to be intuitive but then came Jony Ive to fix that. If i was to turn private browsing on can the gov still trace my ip address? Private Browsing does not obfuscate your IP address, it simply prevents the storing of cookies and caches on device. It is not a VPN or a spoofer, it is client side privacy. Thus if someone else were you to pick up your iPhone, they could not see your activity. It has no impact on your IP address. Hi Friends , I’m using Iphone 4s installed the Private browser , I have download the more than 20 videos . When open the videos option I was wondering there was no file in the videos folder.Please help me how to Retrieve those files. Pls call me 9952030120 help required. I usually appreciate your “Related Articles” section at the bottom of pieces, but some of these are way out of date—don’t apply to current releases. Barring getting someone to do the tedious task of pruning, is there any way to automatically associate OS X and/or iOS version numbers with each link, along with article date? In general, very helpful website! Thank you!